Candles vary a great deal in how long they burn, but if you're looking for lasting light, candles made from high quality ingredients and hard waxes are your best bet. Whether you're searching for lasting candles to store in case of an emergency or power outage, or you'd like to get the best value for your candle dollars, lasting candles are a good choice. The two main materials to consider for candles that last are the wax and the wick. The wax is ultimately the most important element in any candle, so always consider what type of wax is used before you make a purchase. Here are some good ones to look for. 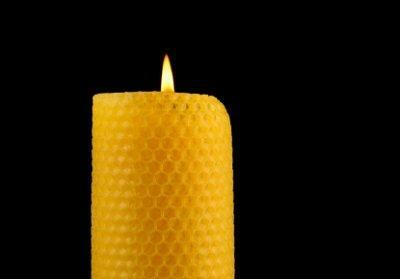 Beeswax is a natural product, and is a hard wax that makes great candles. The scent is light and sweet, and the criss-cross texture of beeswax makes it stand out from the smooth surfaces of other candles. Candles made from beeswax can be molded, dipped, or rolled. Since the wax is harder than most commercial waxes, it burns slower and lasts much longer, giving you lasting light candles. As an added bonus, this type of candle gives off less smoke and causes less sooty residue, and drips much less than most other waxes. Gel candles are very pretty and can be found in lots of different colors and designs. One of the great things about gel wax is that, even though it's very soft, it burns slowly and lasts a long time. Candles made from gel wax can also give off more light than traditional candles, because the flame is often reflected in the clear gel and bubbles within. Stearin - Also known as stearic acid, stearin can be found in animal fats and tropical plants, and can be purchased from most candle supply stores. It adds luster, makes colors more vivid, aids in mold release, and hardens the wax so candles burn longer and brighter. Crystals - Crystals for candle making are clear crystals or luster crystals. Luster crystals have the same effect as stearin, while clear crystals have the added benefit of getting rid of surface bubbles. Vybar - Vybar is a synthetic compound that can be added in small amounts to candle wax to increase burning time. The other main part of a candle, besides the wax, is the wick. Wicks are made from many different materials, and some of them burn better than others.Choosing a candle wick can be tricky, since the type you use depends on the type of candle being made. Generally speaking, however, tightly woven and cored wicks will burn more slowly than others. Wicks are generally available made from zinc, cotton, or paper. Zinc wicks are the strongest, while paper wick burn most quickly. This is a general gauge, however, as some wicks are coated or treated to last longer or burn more evenly. In your search for lasting candles, you may have come across a product called an emergency candle. These are tall, relatively thin candles that come in a high glass container. They're often sold in a variety of bright colors as well as white. Emergency candles are meant to be purchased and stored, for use in the event of a power outage or other emergency. They usually contain paraffin wax that has been hardened with the aid of additives, and they do last quite a long time. These candles are unscented, but they will leave a sooty residue on the sides of the container. Keep them away from curtains, walls, and furniture to avoid getting black soot on them. Once you've found a long lasting candle, it might be tempting to light one and leave it for hours at a time. This is especially true for emergency candles, since they are designed for exactly this purpose. No matter what you're using candles for, remember that they use an open flame, and as such, are a fire hazard. Never leave a lit candle unattended.